Many people may not know that the second biggest city of Austria, Graz is home to a major European technology cluster. A lot of innovation particularly in the areas of automotive and semiconductors originate from there and so does critical contribution to the RFID and NFC standards. Therefore, it comes without surprise that Infineon — a leading semiconductor and sensory manufacturer — has tasked its engineering team in Graz to look for NFC enabled blockchain security solutions. What the team has then developed is the rather cryptic sounding “Blockchain Security 2Go”-Card. Here at Lab10 we rather like to call it The Card to render homage to its killer blockchain security feature. The name of the card should not mislead you tough, it comes with some quite spicy & hot features. It supports 255 public/private key pairs and brings cold key and identity storage/management to any blockchain. Simply put, it adds security without compromising on usability and hence can underpin a plethora of important blockchain enabled use cases - may it be to secure assets, accesses or identities. Here at Lab10 we are super excited about this piece of hardware and have big plans with it. It will play a pivotal role as part of Minerva, a digital ID wallet we develop together with the Finnish Innovation Fund Sitra. Together we aim for a broader push to foster a human centric data economy in the EU. Minerva will eventually empower EU citizens to control their identities, data and money all in one app. Expect more on this exciting project in future posts. Infineon has organized a hackathon to introduce the card to the broader developer community. It was a 24h coding event with more than 50 developers across 10 countries as part of the recent #LetsCluster Summit. It has been the perfect playground to get in touch with this card first hand. Lab10 hack streaming PLAY Tokens in exchange for music via NFC. We managed to stream (in its semantic closest sense) “Streemable PLAY Tokens” (SPLY) as the music was playing. When the card is in touch with the NFC reader, the record player starts playing in exchange for tokens. When the card is removed, the streaming stops and so does the music. Quite rad, isn’t it? The PLAY tokens used here were minted in 2017 on Ethereum in the context of the Play4Privacy project. We moved some of them over from the Ethereum chain to the ARTIS chain, converting them into “Streemable ERC20 Tokens” in the process. 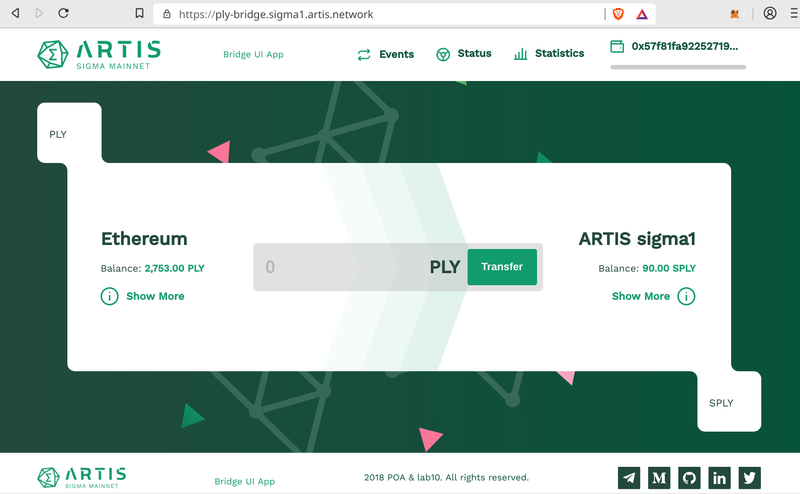 The bridge application for moving tokens between Ethereum and ARTIS. The jury was intrigued by our little hack and we were awarded first place of the blockchain track. 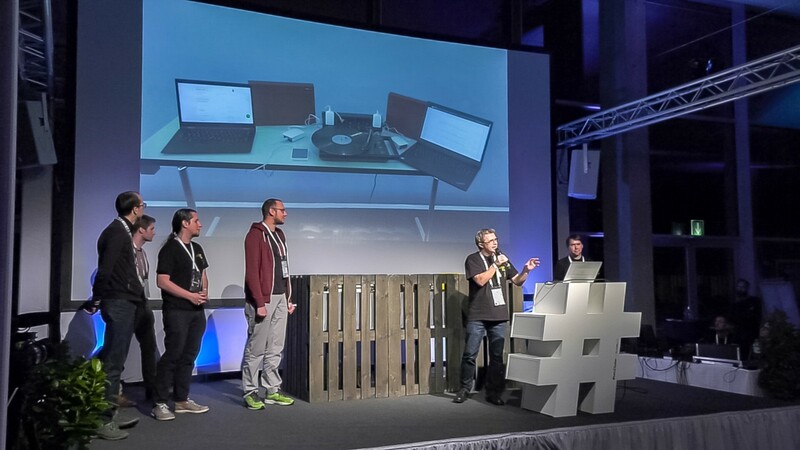 Thomas Zeinzinger & Team Lab10 Collective rocking the stage at the Infineon Hackathon. We will empower everyday citizens (aka grandmas & grandpas) to easily cold-store their assets, data and identities without changing existing habits. We are currently experimenting with integrating the card with the Burner Wallet and have built a PoC which certainly will find its way into Minerva. Users will be able to sign transactions with the card. Hit us up on Telegram for some ATS coins so you can play with the PoC and send ATS to friends. As already teased above, we are also in the mids of developing Minerva, the world’s first genuine full fledged digital ID wallet that does not only store digital assets but identities too. The security of this wallet will be greatly enhanced with the card. If you are interested to implement the card into your application, hit us up on Telegram or write us at love@lab10.coop and let’s talk. At Lab10 Collective we are all about collaboration. We are keen to support projects that bring people towards controlling their identities, data and money. The Infineon Hackathon has been a serendipitous experience. We would like to express our gratitude to Günther Wellenzohn, Infineon Austria’s Head of Innovation Management for his continuous and relentless support of the blockchain ecosystem and Rafael Gattringer and his team for organizing the hackathon and delivering on this amazing experience. Last but not least, a shout out to our fellow Hackathon participants. Let’s keep on #BUIDL-ing. Let’s Co-Create A Human Centric Data Economy.